Manufacturer; The Herter Looms, Inc., New York, New York. George Booth was inspired to mark the end of World War I in 1918 with a commemorative tapestry designed in the European tradition. His pen and ink sketch was submitted to renowned designer Albert Herter in New York City, who developed Booth’s concept and oversaw the work’s production by the Herter Looms in 1920. The resulting tapestry is beautiful, unique and dense with political symbolism. Since the Middle Ages, tapestries functioned as a means to document and glorify the “progress” of civilization. The Great Crusade presents America, whose involvement in the battlefields brought the war to an end, as the savior of European culture. 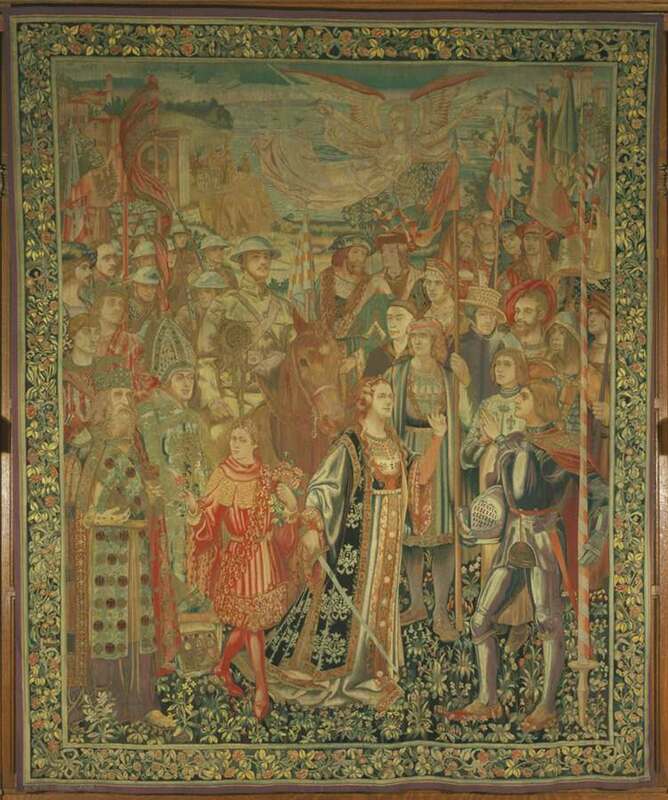 The tapestry depicts the great political and religious leaders of Europe’s cultural past stranding on the ground (Henry VIII, Francis I, Joan of Arc, among others) welcoming the triumphant victor, General Pershing on horseback, leading his troops. A renaissance-style angel of victory is suspended in the sky above the crowd, accompanied by American bi-planes, the first ever used in warfare. The tapestry is a “red-carpet” homage to the victors.